As I mentioned before, it’s just as important to use the correct car seat as it would be to buy the best car seat on the market. You can have the world’s best seat but if your child is too big for it or in the wrong position then the car seat will be worthless. Only upgrade car seats when you have to. Upgrading to the next seat up should not be based solely on age but rather on if your child has met a limit of their old seats. Note: These are all the basic guidelines. Each state has slightly different car seat laws so make sure you check out your state’s car seat laws; they may be more strict then these basic guidelines. Note on Infant Seats: As you could use a convertible seat starting from newborn, you could upgrade to a convertible seat at any age/height/weight. However, here are the maximum limits for infant seats so that if you do use an infant seat, you can know when you must upgrade. Weight Limit – If your child is over the weight limit then they need to upgrade car seats. This will vary depending on your infant seat. Most infant seats now seem to go to 35 lbs, however 20, 22, and 30 lbs are also common. Check the label on your car seat (or the manual) to see the weight limit. Height Limit – If your child is over the height limit for the infant seat then they will need to upgrade car seats. This once again varies depending on the car seat so make sure to check that label. Head Height – This rule tends to coincide with the height limit however sometimes you can have a child who still fits the height limit but does not fit the head height limit. Age Limit – Children must be at least 4 years old before moving into a booster. However, that is the minimum age. Many kids are not ready for a booster seat until much older. Maturity Level – As mentioned above, age isn’t everything. Your child must also be able to sit in a booster seat properly and keep their seat belt where it should be. If they cannot do this, then they are not mature enough for a booster (it doesn’t matter if your kid is 4 years or 8 years, maturity is what matters in this case). If your child is too big for their convertible car seat but still isn’t ready for a booster seat then you need to upgrade their convertible car seat (sometimes referred to as a combination seat). You will need to find a 5 point harness car seat that has a higher weight/height limit so that your child can continue to ride safely. My recommendation is to buy a convertible car seat that will get you all the way to 80 lbs as then you can skip the booster seat all together (or buy one with an even higher weight limit as some kids won’t be ready to get out of a booster at 80 lbs) This way you only need to buy one seat, instead of buying a bigger convertible seat and then buying a booster. Weight Limit – If your child has reached the weight limit for their convertible car seat then they need to upgrade. The weight limit varies on all car seats so check the car seat label. 40 lbs is common but more car seats are increasing their limits to 55, 65, and even 80lbs. Height Limit – If your child has reached the height limit for their convertible car seat then they will need a new seat. Once again, the height limit will vary from seat to seat so check the label. Ear Level – This usually coincides with height but not always. When the top of your child’s ears have reached the top of the car seat then it’s time to upgrade. Note on Booster Seats: These seats are used for when your child is too big for a convertible car seat but is still not old enough for an adult seat belt. A 5 point harness convertible/combination car seat is much safer than just a booster and a 5 point harness will offer more protection for your child in an accident. I recommend buying a convertible/combination car seat that will last all through the booster seat years because a 5 point harness is that much safer than a booster seat. Height Minimum – In order for a child to ditch the booster seat they must be at least 4’9’’. This is just the minimum however, there are plenty other requirements that kids need to meet before using an adult seat belt. Age Minimum – In order for a child to use an adult seat belt they must be at least 8 years old OR already meet the height minimum requirement. Once again, 8 years is just the minimum and it does not necessarily mean that your child is ready for an adult seat belt. This age minimum also varies by state. Some states say 8 years, some say up to 12 years so make sure to check what your state’s law is. 5 Step Test – If your child meets the age and/or height minimum then you need to see if your child passes the 5 step test before allowing them to use an adult seat belt. The 5 step test is to ensure that your child is mature enough to use an adult seat belt. Child can sit all the way back against the vehicle’s seat. Child’s knees bend comfortably at the edge of the vehicle’s seat. Rear facing is safer than forward facing so long as your child still meets the rear facing weight/height limits. Age does not have any effect on whether or not rear facing is safer; it is solely based on weight/height limits and spinal development. Therefore, if your child still meets their rear facing weight/height limits then they are safest rear facing. Many state laws do state that it is 1 year or 20 lbs but there’s a loop hole…they also usually include “or what the car seat’s manual states” or something to that extend. This is the loop hole that actually makes the law 1 year AND 20 lbs. As far as I know, no car seat manual says you can forward face at 1 year or 20 lbs, they all say 1 year AND 20 lbs. Why the state laws haven’t just converted to the 1 and 20 lbs rule is beyond me. AAP Recommendation – I have a whole post on extended rear facing, however I do feel the need to add that while it is the law to rear face at least till 1 year and 20 lbs, the AAP now recommends keeping your child rear facing until 2 years of age or until they meet their seat’s weight/height limit. Weight Limit – Your child must be at least 20 lbs before forward facing however, they can remain rear facing until they meet their car seats rear facing weight limit. For some seats this is 20 lbs but it can also be 30, 35, or even 45 lbs. 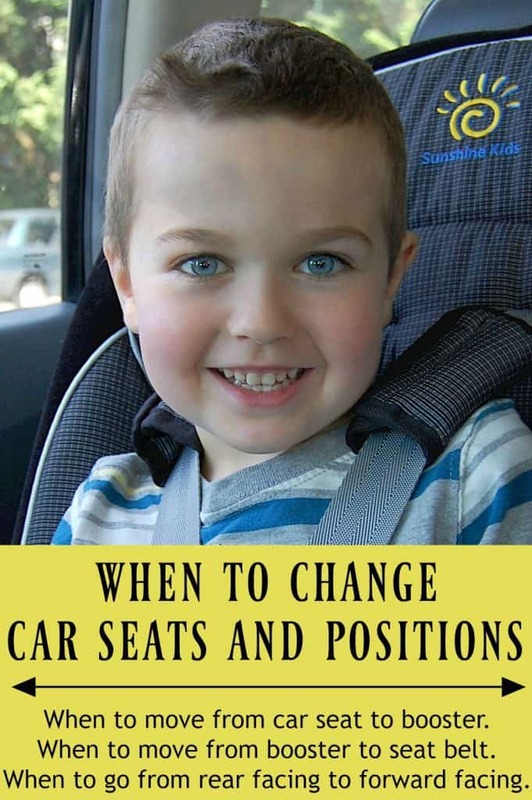 If your child is still rear facing past 20 lbs then you need to make sure they still meet the rear facing weight limit, otherwise you must turn them forward facing (or buy a new rear facing seat with a higher limit if you wish to continue rear facing). Height Limit – If your child has outgrown the rear facing height limit of their car seat then it is time to forward face them (or buy a new rear facing seat with a higher limit if you wish to continue rear facing). Head Limit – If your child’s head is within 1″ (some car seats are 1.5″) of the top of the car seat then it’s time to forward face (or buy a new rear facing seat with a higher limit if you wish to continue rear facing). All children under the age of 13 years old (whether in a car seat, booster, seat, or adult seat) should ride in the back seat of the car (When it is practical. Obviously a truck that has no back seat would have to be an exception, for example) If you must have a child under 13 ride in the front seat then make sure to turn the air bag off. I know that is a lot to take in. Thankfully you don’t get quizzed on this stuff! 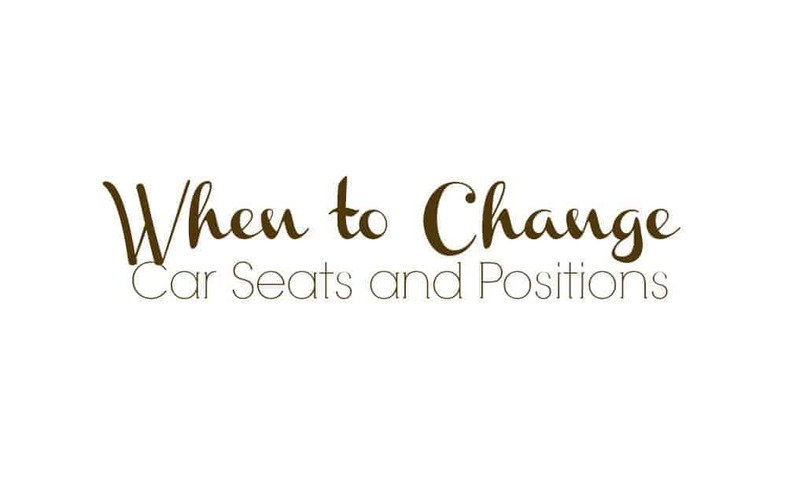 Just remember to check your child’s car seat limits often and you can always refer back to this post if you can’t remember when to change car seats or positions. This is a great guide to keeping our most precious cargo safe. I would encoyrage people to look up tgeir state laws too. In our state a child cannot use the adult seatbelt until age 12 or 80 pounds+height requirement. I was the biggest kid in my class at 11 years old and 80 pounds and no adult would have thought to put me in a child safety seat, but if it were today it would be the law. What state are you in? I've never heard of a state with such a high age limit. Not that I"m against it! You are correct however, state laws vary greatly. Great tips! This is a topic of that causes alot of confusion among new moms. I agree about checking on your state laws as well-gotta keep our kids safe! Great guide! I always worry about their carseat being safe! Wonderful information! Charlie is 14 months and 25 pounds, and we're struggling with not turning him FFing since he HATES the car so much. I know that turning him around will help with the hatred of the car, but I'm fighting the urge. His car seat is a convertible that will allow him to RF until 35 pounds, so we're going to at least try to make it that long! Great information! It is so important to use the car seat and keep the kids safe! I am sharing this! This is a lot of great information, although you should always check with your state regulations because each state has their very own laws as to when a child can move onto the next stage seat or not. And I learned quite shockingly that each state differs quite a lot! In fact in Idaho, both of my boys do not LEGALLY need to be in booster seats. They are over 6 years old. They are legal to sit in a regular seat. But for my sanity, BOTH are still in a booster in the back seat. Yet in other states, kids can't move onto an adult seat until they reach a certain height, or until they are 12 years old. So…while these are definitely great guidelines, make sure your state doesn't have more strict laws to follow before moving your child up. People need to realize that when you switch from rear to forward facing and each time they "graduate" into another type of seat, they lose protection. 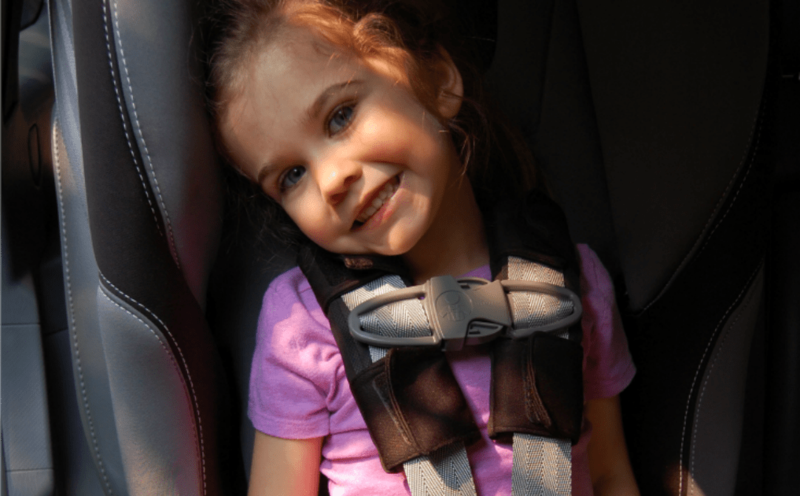 Keep kids rear facing as long as possible and keep them in the 5 PT harness as long as possible, too. The safety of children is most important when it comes to traveling in car. The major cause of child death in car crash is due to wrong kind of seats and seat belts. So, the parents must take precautions and choose proper seats for their kids.